You will work in continues rounds (do not join each round). Use a stitch marker if needed. Round 26: DC in first stitch, HDC in next, SC in next, Sl St in next, SC in next, HDC in next, repeat around. (At the end you will SC at the bottom of the chain 2 and fasten off since you won’t be able to make the last slip stitch). Fill carrot with a treat. I used orange jelly beans but you could put in goldfish, gummy bears or anything you’d like! I recommend packaging food items in a plastic bag first. Thread green ribbon or a couple strands of yarn between the DC stitches in round 23. Tie tightly in a bow! I made about 20 of the Valentine "hugs and kisses" bags. 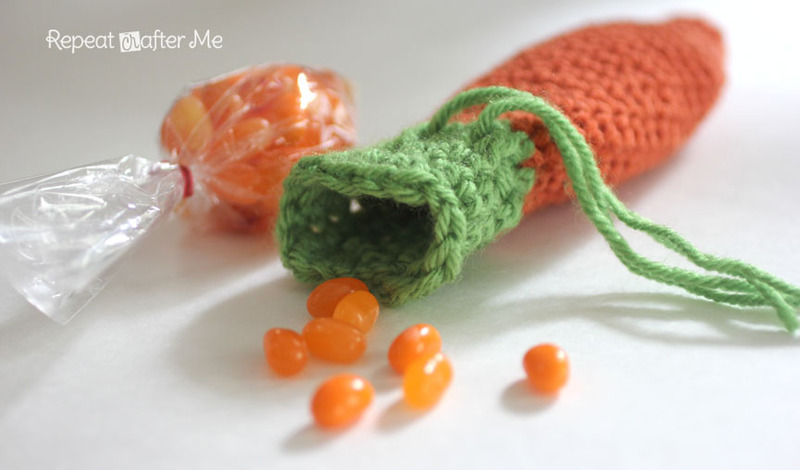 I happen to have orange yarn so now I'm going to make the carrot treat bags. Thanks so much for all your patterns. They are adorable, fast and fun. awesome. I'm on my third one tonight. I love your blog! Lovely idea, thank you very much! I guess its cuz im new at this but. Lost when I dont join each round. Im stuck there what do I do? Such adorable carrot pouch. I definitely pined it to my crochet board and thanks for sharing Sarah! 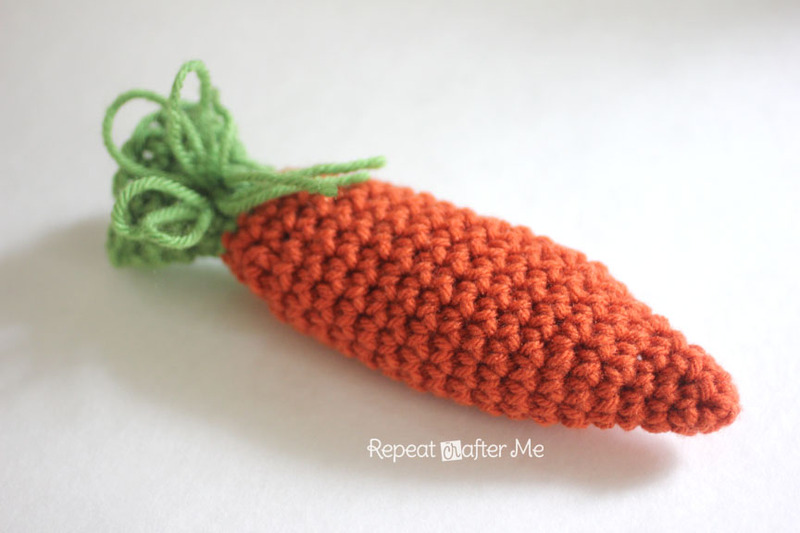 I've been crocheting some carrots to use up some orange yarn, but not little pouches, brilliant! I'm thinking I could make some really huge versions to fill with healthy treats for Purim! Craft schooling Sunday has resumed after a 2 month break, would love to see you there! I stopped at round 24 and did the following instead: when finishing round 23, join with a slip stitch and *(chain 11, sc in 2nd Ch from hook, Ch 1, sc on each of the 9 remaining ch's, sc in next 2 dc) repeat from * 6 more times. You will have 7 leaves. After last leaf, sc in any remaining dc's, finish off and weave in ends. Follow remaining instructions from original pattern.
. I think you will like my carrot top so try it out. And thanks again for the pattern and inspiration.